An Angel queen of dragons. Very impressive detail. Each figurine is individually numbered with a small metal plaque embedded at the base. Cast in the finest solid resin before being painstakingly hand-painted, this piece exudes an air of mystery and magic and makes a fantastic gift for those in your life who have a touch of the dark and mystical about them. Arrives in an designer box with artwork within protective polystyrene casing. 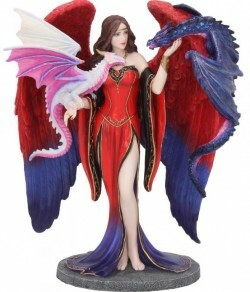 Designed by renowned fantasy artist James Ryman.